Not every general counsel role is filled by search firms. It really requires a lot of networking … And unfortunately, a lot of people network only when they need something, and that’s sort of too late. You need to be building and maintaining your network when you don’t need to ask somebody for something. The article does a good job summarizing where WOMN has had success so far. 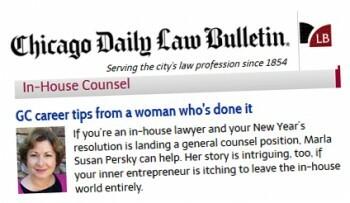 “Pairing senior associates or junior partners with general counsels, the program helps women hone the finer points of growing a book of business in their law firms. The first mentor programs were based in New York, but they are expanding to Chicago in July and currently accepting mentee applications. We’re delighted with the recognition.